Drinks World catches up with Gareth Evans during Singapore Cocktail Week. 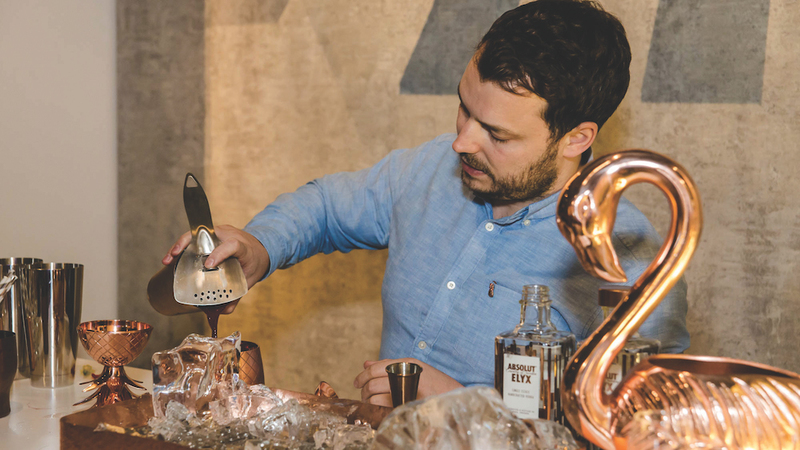 Gareth became the Global Brand Ambassador for Absolut Elyx Vodka last year and talked with Marc about his time so far and what to expect in the future. The idea with Absolut now is to take what we’ve done in the US and translate that in other markets. However, we understand that some of the cocktails they make in the US won’t fit the Bulgarian, Singaporean or even Sydney scene, so we will need to tweak it as we go. What do you think Elyx’s success in the US boils down to? I think its a combination of things but obviously it helps that we have a strong brand name and identity there. The brand identity of Elyx is so different to Absolut, they’re sort of polar opposites. I guess that’s one of the, not so much ‘challenges’, but its been at the forefront of what we’ve been doing, which is separating one from the other. You get asked, “Oh so its a better version of Absolut?” but no, its not that at all. Its completely different. They are two separate products with two separate brand identities. That’s what we need to focus on This year. How has the change in role been for you from working behind a bar to now the Elyx Global Brand Ambassador? Its completely different for me. I started out working behind the bar and then moved on to designing bar programs and then the bars themselves. The latter half of it was travelling around and training people and, essentially doing what I’m doing now, being a Brand Ambassador for Elyx. I would go to trade shows, bar shows and run masterclasses. People always wanted to know about restaurant bars and about Jason Atherton who I was working for at the time. Eventually I ended up being a brand ambassador for Jason, where I gained a lot of experience that I can apply to the role I am in today. There has been a trend that bartenders are just deliberately not caring about vodka. That’s changing. Why do you think that’s changing and what are you doing to make that change? I think bartenders in general are looking for spirits, produce and ingredients with provenance and integrity. Singapore is probably a bad example of this because most things are imported, but if you’re in Australia there are things that are grown there that aren’t grown anywhere else. You’re seeing more bartenders doing that now. Searching for things that have provenance and locality and this is growing in spirits as well. People are looking for spirits that are made well and with love and quality. I think that fits with what we’re doing quite well. There are a lot of bartenders now that understand there are many vodka cocktails. If you get any classic cocktail book, one of the really old ones, vodka wasn’t necessarily available. Talking about the 1860s, vodka wasn’t even in the US. Its important to understand that bartenders are making drinks for their customers and people like white spirits. If you’re looking at the most successful brands its going to be white rum, gin and vodka. Its because it lends itself to really clean, refreshing, eye-opening drinks. There’s no better drink than the martini, its a key drink. A year before I was working for a brand, that was my drink. I don’t think there’s anything really like it. Its vodka’s time to take the martini back. When you’re done with this year and you look back, what were some of the goals you set for yourself? For me, its more on a day-to-day basis. You go into a training session and each one you get slightly better than the last and you understand a little bit more. There are certain markets where you get bartenders who sit there and are like, “Go on, impress me” and at the end of it they come over and grudgingly say, “Well, that was pretty good” and I hope that that’s what we’re putting across. We genuinely care about where our vodka is and how it’s presented and whom it goes to. I’ve worked in bars for nearly 16 years, and some very good bars at that. I’m not going into their bars saying, “Maybe you could stick this on the menu?” It just doesn’t work like that. I want it to be an organic, natural thing. Previous article‘Employees Only’ – New York’s Famous Speakeasy is Coming to Singapore!